A 6.4 magnitude earthquake on Saturday shook down a 17-story building, trapping about 170 people in southern Taiwan’s Tainan City. The earth quake occurred in Kaohsiung city at 03:57. The first floor of the building was a mall and the rest were populated with more than 60 households of about 200 people. Rescuers have managed to rescue 34 out of the building as well as an infant. Pipeline was broken and roads were flooded. Traffic has been interrupted near the site. Residents in Xiamen, Quanzhou, Putian, Fuzhou and other regions felt the quake; many said they were woken up in the middle of the night due to the tremors. Rescuers mounted hydraulic ladders and a crane to scour the wreckage and pluck more than 120 survivors to safety, with at least 26 taken to hospital, a fire brigade official said. One elderly woman, wrapped in blankets, was strapped to a board and slowly slid down a ramp to the ground as the cries of those still trapped rang out. Rescuers used dogs and acoustic equipment to pick up weaker signs of life among the rubble. 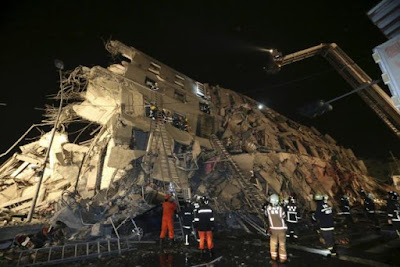 “There are 60 households in that building,” said Tainan City Government Fire Bureau information officer Lee Po Min, estimating that there might be about 240 people living there.